Reddam Racing’s Nyquist was caught wide on both turns but his outside post proved no detriment in the $1,840,000 Breeders’ Cup Juvenile (G1), rallying boldly to the lead in upper stretch and proving best by a half-length. Unbeaten in five starts, the three-time Grade 1-winning colt locked up the Eclipse Award for champion 2-year-old male and established himself as an early favorite for the 2016 Kentucky Derby Presented by Yum! Brands (G1). Trained by Doug O’Neill and ridden by Mario Gutierrez, Nyquist is from the first crop of 2010 champion 2-year-old and Breeders’ Cup Juvenile winner Uncle Mo. The bay Kentucky-bred raced within striking range in midpack during the early stages as Riker flashed to the front and established opening splits of :23.49 and :47.62 while being chased by Unbridled Outlaw, Conquest Big E and Cocked and Loaded. Nyquist was still biding his time in sixth, a little more than three lengths back after three-quarters in 1:12.14, before beginning to advance toward the front rounding the far turn. Traveling wide the entire way, he was given his cue by Gutierrez nearing the conclusion of the bend and accelerated to the lead as the field straightened for home, passing the mile mark in 1:37.26 with a one-length advantage. Swipe offered a nice run from the back of the pack to reduce the winning margin in the final sixteenth of a mile, but Nyquist was never seriously threatened as he completed the 1 1/16-mile distance in 1:43.79 over the fast track. Gutierrez proved cool as a cucumber despite breaking from post 12. Out of the Foresty mare Seeking Gabrielle, Nyquist was bred by Summerhill Farm and sold for $400,000 at the Fasig-Tipton Florida March 2-year-old sale. He captured his career debut, a June 3 maiden special weight at Santa Anita, by a head before posting a 5 ¼-length victory in the Best Pal (G2) at Del Mar on August 8. Nyquist followed with a facile 3 ¾-length tally in the September 7 Del Mar Futurity (G1) and made his two-turn bow in the FrontRunner (G1) at Santa Anita on September 26, scoring by nearly a length after repulsing a couple of stretch challengers. O’Neill is looking forward to the Kentucky Derby trail next year. Nyquist was off as the 9-2 co-second choice among 14 runners. Swipe, who finished second in the FrontRunner, was overlooked at 29-1 and finished 2 ¼ lengths clear of the 6-1 Brody’s Cause in third. Next came Exaggerator, Cocked and Loaded, Riker, 7-2 favorite Greenpointcrusader, Conquest Big E, Waterloo Bridge, Siding Spring, Rated R Superstar, Unbridled Outlaw, Isotherm and Ralis. Tale of S’avall was scratched and Tom’s Ready didn’t draw in from the also-eligible list. With the $1.1 million payday, Nyquist has now earned $1,613,600. 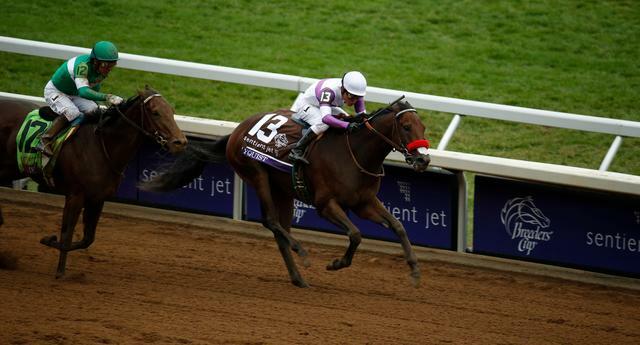 Nyquist also is the leader on the "Road to the Kentucky Derby" with 30 points. The updated Road to the Kentucky Derby Leaderboard can be found here . The updated Road to the Kentucky Oaks Leaderboard is here .